Known primarily by his pen name, and as the author of Animal Farm and Nineteen Eighty-Four (1984), George Orwell wrote several books based on his beliefs against class systems and dangers of political thought. The aforementioned books made Orwell famous and financially independent. However, only his life experiences and choices allowed him to create such believable characters in an eerie universe much like our own. Even his friends knew him as George Orwell; his real name, Eric Blair, was something of his past in India and showed his change from working for an imperialist government to despising it. Born in Bengal, India, he eventually went to school in Sussex, England where he was known as a brilliant student from a lower, middle-class family. Young George decided that he would rather travel and join a government office instead of going to university, even though he had won various scholarships for a few of his early writings. He joined the British Imperial Police and was immediately sent to Burma, where he stated later that he saw the truth behind the matter. The natives of the land despised Britain’s presence and the strife it caused didn’t appeal to Orwell as much as writing did. This experience is discussed in Orwell’s early novels, entitled, Burmese Days. Orwell returned to Europe where he decided to live in the poverty-stricken areas so he could see how the people lived. He also felt that he had a moral obligation to make up for his past in Burma, which caused him to be separate from the real people of the country. Living in the Paris and London slums, he worked as a dishwasher and even as a farmhand. Such experiences inspired him to write Down and Out in Paris and London, which was published in 1933. Inspired to travel and write more about the world and the situations around him, Orwell set off for Spain where he wanted to gather information about the civil war occurring there. He was not only injured in a battle near Barcelona, but he became frightened of the communism and socialism that was permeating society. 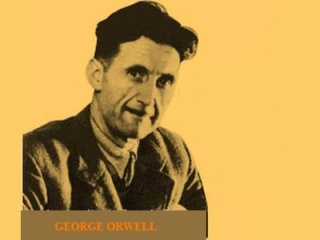 Knowing not whether to trust any form of government due to its oppressive nature on the people, Orwell dubbed himself an anarchist and a rebel. His book Homage to Catalonia has been reviewed and held as a wondrously well-researched book by academics and mainstream critics alike. In fact, after Nineteen Eighty-Four and Animal Farm, many consider it his next finest work. Although the autobiography of George Orwell was never published during his time, his own writings about his early life in Such and Such were the Boys were released in 1953. In Nineteen Eighty-Four, Orwell warns society about the Big Brother of the government watching over its people, preventing them from becoming free thinkers and keeping close tabs on each individual in society. Many, especially with his uncanny political foresight and criticisms, have considered his writings, although prolific, impressively prophetic. View the full website biography of George Orwell.